said Wayne Berson, CEO of BDO USA. Peter Bartos, Managing Director and Partner of BDO Austria Group confirms, that the changeover is a happy event and a perfect complement. "We are very pleased to welcome 65 experts. Herewith we continue the consistent expansion of our competencies in the fields of auditing, tax advice, accounting services, financial advisory services and forensic, risk & compliance." "With now 500 employees in Austria, and 60,000 worldwide, BDO is an attractive partner for both global players as well as for expanding Austrian SMEs." Bartos continued: "BDO achieved global sales of $7.02 billion in the fiscal year 2014 and is currently active in 152 countries. Our experts are available for a wide variety of topics. A contact person for each client ensures a very pleasant, trustworthy and effective cooperation in all areas. Depending on requirements, internal specialists are consulted and provide services in top quality." ​BDO is an international network of public accounting, tax and advisory firms which perform professional services under the name of BDO. The fee income of the member firms in the BDO network, including the members of their exclusive alliances, was $7.02 billion in 2014. These firms have representation in 152 territories, with almost 60,000 people working out of 1,328 offices worldwide. 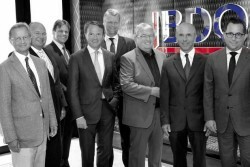 ​BDO's story is one of continuously responding to ever changing client needs: ​BDO was founded in 1963 when firms from the UK, Netherlands, Germany, US and Canada joined forces to share and expand their knowledge to better serve our clients. The local knowledge of the member firms combined with the international expertise and strength of the network ensures effective and efficient service delivery to all of BDO's clients in every country in which BDO is represented.